Corsair has enjoyed popularity in several markets, often delivering products which become the benchmark within their particular category; all-in-one watercooling is, without doubt, one of those categories. Their portfolio has developed over the years, starting out with modest 120mm radiators with a single fan and slowly moving their way up to fully fledged 360mm radiators. Today we look at their latest 280mm variant, the Corsair H115i Platinum RGB. 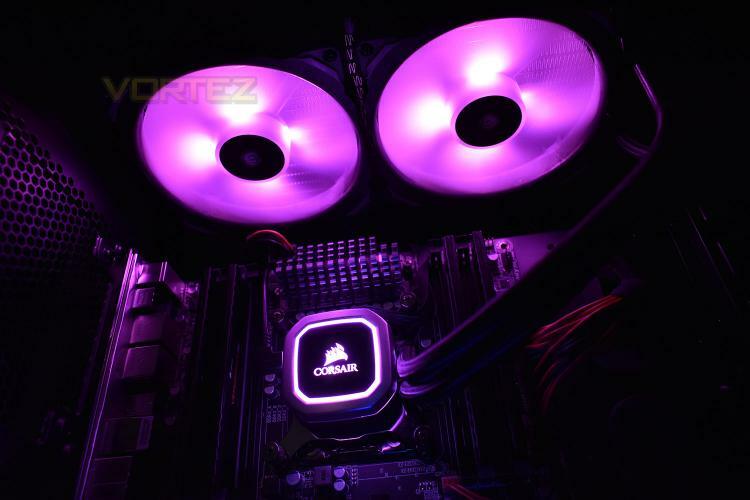 The Corsair H115i Platinum RGB boasts a revised CPU block with 16 individually addressable LED lights, as opposed to the single selectable colour on the H115i Pro RGB. Along with the revised lighting is a larger cold plate for better thermal conductivity and performance overall as well as an improved radiator core for larger surface area. AM4 support is there, for the latest AMD Ryzen CPUs, but for the first time with a Corsair all-in-one loop we also get AMD ThreadRipper socket compatibility. Of course, the usual Intel sockets are also catered for. The H115i Pro RGB that this replaces came with a pair of Corsair ML140 fans, renowned for their quiet operation and high static pressure. The H115i Platinum comes with the same ML140 fans, but with RGB LEDs infused within for that extra bling, all of which is controlled via the pump housing. Obviously, the focus is on visual differences, with the extra LEDs plastered all over, but with a larger cold plate and revised radiator, what differences can we find in performance? The CORSAIR Hydro Series H115i RGB PLATINUM is an all-in-one liquid CPU cooler built for extreme cooling with a 280mm radiator and vivid RGB lighting from 24 LEDs. Two CORSAIR ML PRO RGB 140mm PWM fans run up to 2,000 RPM, alongside an optimized cold plate and pump design that delivers the high performance Hydro Series cooling. Take control with CORSAIR iCUE software to customize lighting effects and enable Zero RPM mode at low temperatures. Easy to install and compatible with most modern CPU sockets, the H115i RGB PLATINUM pairs killer looks with chiller performance.